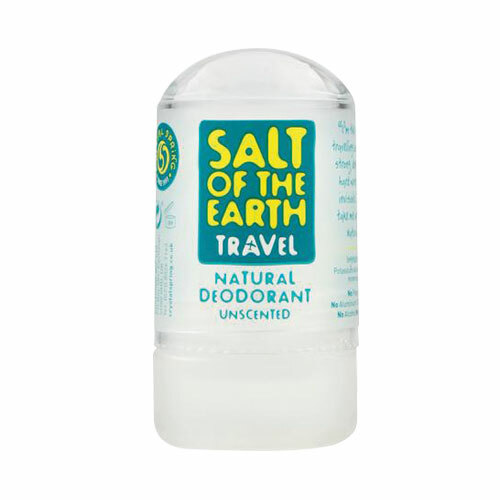 This small travel size crystal deodorant stone is great for taking on holiday. Its small size means that the normal fight for space in your wash bag between your deodorant, hand towel and tooth brush will be a thing of the past. Like the Classic deodorant stone, it is made purely from natural mineral salts, and is effective at keeping body odour at bay. It is unisex so it can be used by either men or women, and can last for months so it is great for any extended holidays. This crystal deodorant is also a great choice for your gymbag! Suitable for ages 6 and up! 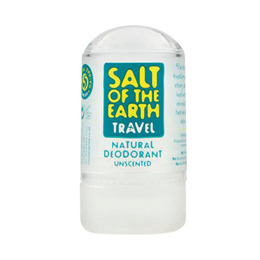 Below are reviews of Salt of the Earth Travel Deodorant - 50g by bodykind customers. If you have tried this product we'd love to hear what you think so please leave a review. Have been using these natural sticks for years. Works very well after coming out of the shower or bath when you are still damp. Last for up to 24 hours. I should have read more into this first before ordering, it is my fault really. It would be OK for travel uses. I thought it was going to be something like a roll-on deodorant but it's nothing like that. In the mornings is when I would likely use the deodorant and I would have to wet the stick first before applying it. It is small as well, probably a little too small for me. My main reason for purchasing was that it was on offer, 20% off I think. I won't be buying this again though. Disappointed with this product after all the great reviews. Can be uncomfortable to apply to the underarm skin and doesn't feel like anything is being applied which may be why my armpits smell after wearing this. Good companion when you decide to use only natural ways of fighting with sweat and odour. Very easy to use and its small size will fit into any handbag. Can definitely recommend it.